The kentia palm (Howeia) is one of the world's most popular indoor palms. In fact, it's sometimes called the sentry palm, presumably because of the entryways it guards. The kentia palm is perhaps not the most beautiful or graceful of all palm trees, but it has everything you could ask for in an indoor palm. It's shade tolerant, cold tolerant, and doesn't grow too alarmingly large. Under the right conditions, a kentia palm will eventually grow into a magnificent specimen plant, up to 10 feet tall. The kentia palm is usually sold with two to five palms planted together, appearing to have multiple stems topped with graceful, arching foliage. There are two popular varieties: H. forsteriana and H. belmoreana. H. belmoreana is shorter with erect leaflets. It has a long history as a parlor palm and Queen Victoria added them to all of her homes. They were the feature of palm courts at hotels like The Ritz Hotel in London and the Plaza Hotel in New York. Light: Kentia palms prefer indirect sunlight. Do not expose the plant to direct sun unless it is acclimated as a seedling to direct sun. While they can grow in low light conditions, you will get more foliage if they get more light. Water: Water your kentia palm weekly in summer, letting the soil dry between waterings. Do not allow it to sit in water. Perfect drainage is essential. It is good to mist your palm. If the air is too dry or it isn't watered enough you will see brown leaves. If you are watering it too much, you may see yellow tips on the leaves, which can progress to yellow speckling. Temperature: In the cold season, this plant can withstand 55 F, but it prefers warmer temperatures. Soil: A fast-draining, well-aerated potting mix is recommended. Fertilizer: Fertilize monthly only in the spring and summer with liquid fertilizer or slow-release pellets. Palm fertilizer is preferable. 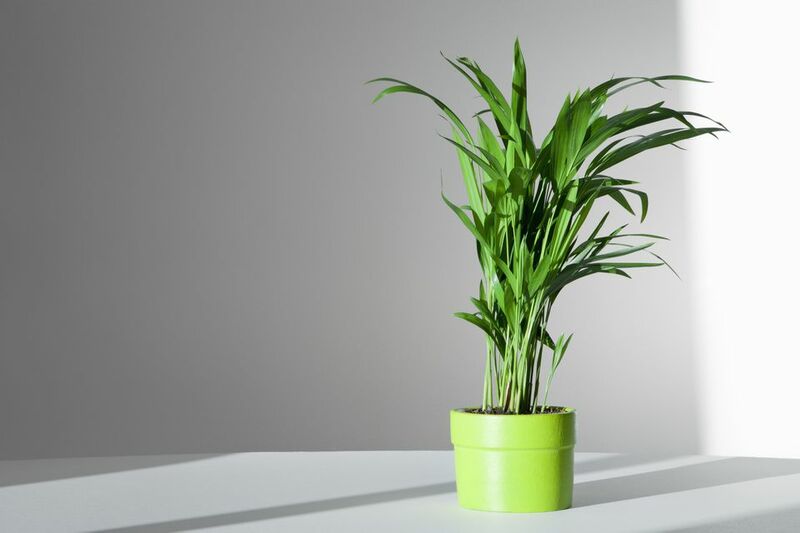 Be aware that this palm is slow-growing. If you fertilize it too much, you may see the tips of the lower leaves turn brown. Kentia palms propagate by seed, but they will rarely seed indoors. Propagation is better left to growers. The seed is imported from Lord Howe Island, which is east of Australia, and grown in Hawaii and California. Repot only when the plant is completely rootbound, maybe every other year or every third year. This will slow the growth rate and decrease the chance of the plant dying through shock. While repotting, go up one pot size and disturb roots as little as possible. A good fertilizer is essential to prevent yellowing leaves, and dead fronds can be removed. Don't top-trim the palm or it will die. The tree will appreciate room as it grows to develop the full canopy—try to place it someplace where people won't be tempted to pull on the foliage. If possible, move the plant outside to a shady location for the summer months, increasing water and fertilizer. Mealybugs and spider mites are the most common pests for the kentia palm. It's best to avoid any alcohol-containing products when treating your palm for these pests. Use an insecticidal soap or neem oil instead. Clean the fronds once a month with a spray of water and a damp cloth to remove dust and help prevent spider mites. What is the Best Way to Grow an African Spear Plant?